There are many games that take place against the backdrop of the Second World War, but there have been a lot less WWII games that really worth to play. But in the case of the Medal of Honor titles that Electronic Arts has so far released the games market, we can at least say that they are really worth. 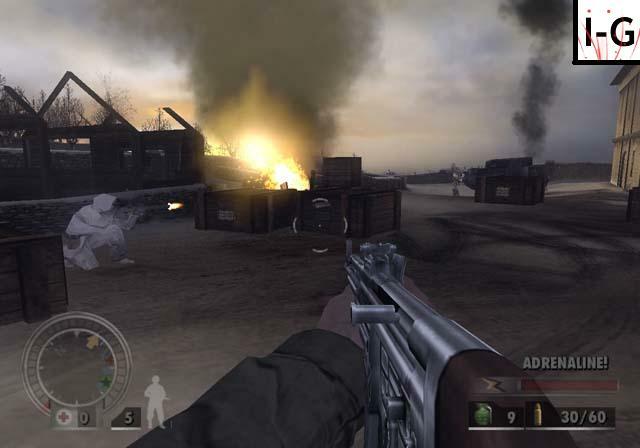 Most of MoH Frontline takes place during one of the most audacious offensives of the Allies during the Second World War, namely Operation Market Garden. History connoisseurs will recall that during that infamous transaction allies defeated a little so the war on European soil have briefly went on. 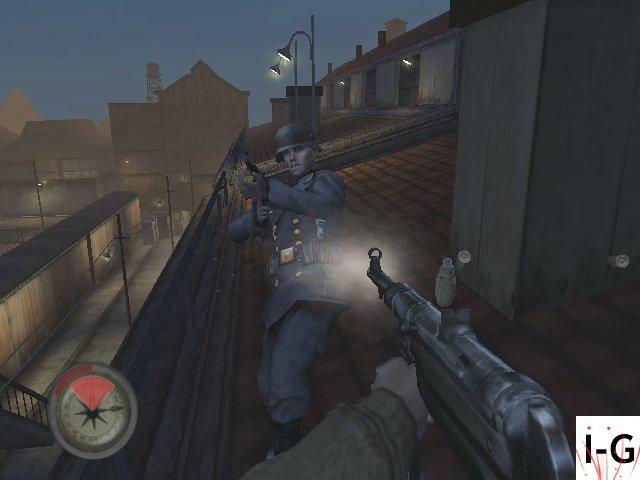 In Medal of Honor Frontline take on the role of Lieutenant Jimmy Patterson, who single-handedly trying to infiltrate the German frontline and mandated a prototype of the HO-IX to steal a jet that the war a very different and negative turn could give the benefit of the Nazis. 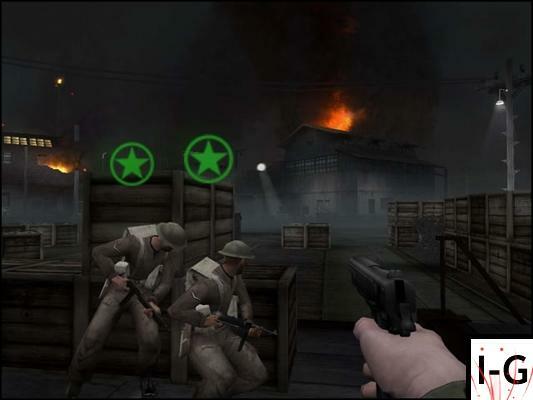 Firepower alone is not enough for Patterson to get behind the enemy lines to get, because "stealth" (stealth) and sabotage are key elements to succeed in this shooter. The MoH Frontline first mission, storming of Omaha Beach in Normandy by the Allied forces (think Saving Private Ryan) that is the legendary D-Day on June 6, 1944. 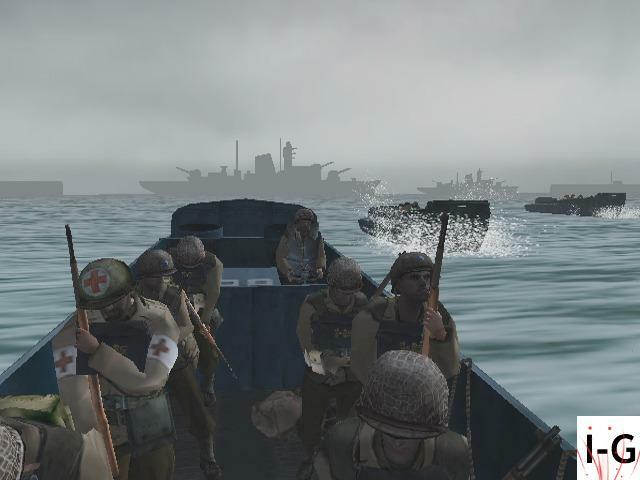 In this opening level you find yourself as a soldier in a Barnes and small transport boat shows in the impressive intro movie many boats destroyed by German bombers, while a few moments later, just before reaching the coast your boat explodes, which Barnes and his fellow soldiers in the water ends up. Many Allied soldiers are still in the water affected by enemy fire, but Barnes and saves it gets later as the commander of his mission to four other fighters allied to the unbroken coast to bring the risk of losing his own life of course. 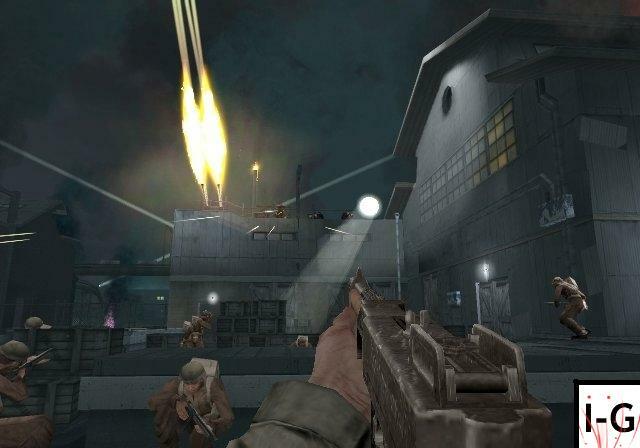 This first mission throws you right in the middle of powerful artillery explosions, bombings and many with Nazi soldiers firing machine guns and by the time you reach your colleagues and looking for cover behind the seawall, you will have many perilous moments have passed. The opening level in Frontline fantastic way to move the tone for the rest of the game and shows fully to what the engine of this shooter in graphics and sound level in all state. Commend my platoon, which consists of three soldiers. I hear the bullets flying around me and see how men fall dead from the non-ending hail of bullets from the Germans. Now and then I venture to my crate to come from behind to try to hit a German, but it is difficult. It was a cold night and we write the year 1942. I, William Holt, serving with the U.S. Office of Strategic Services, "then me with my squad from our live show to save this French city, but it does not look good ... Will you play me like this could get uncomfortable situation? Once you've started the game you're greeted by a menu that was created in an old style. You can compare with old films, where those lines by the constant screen. This taste the atmosphere of the game immediately and you will surely want to some Germans in the pan to cut. This atmosphere remains constantly present. 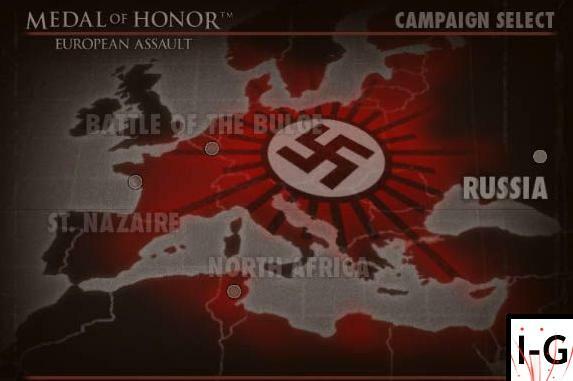 Before you begin a level you really see from the WWII movie that tells what happened there, this is also back in the game. If you are in a mission in Russia and is told in advance that people really had no chance against the Germans, but they still wanted to defend their territory. In this level you get, therefore, instead of soldiers, armed civilians on the road. 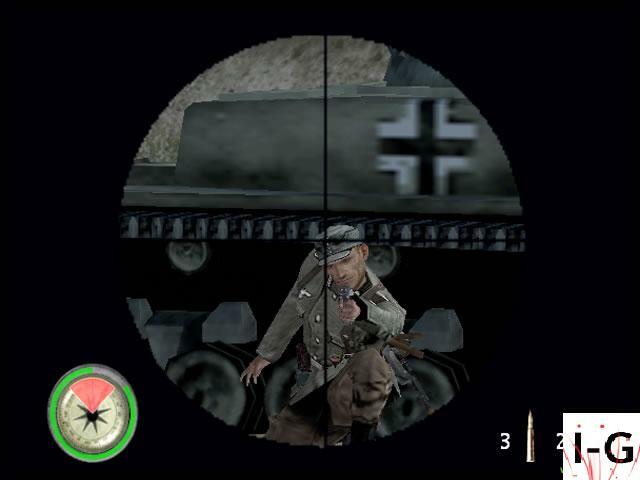 The single player campaign is only a mode where you and William Holt fighting the German troops will go. 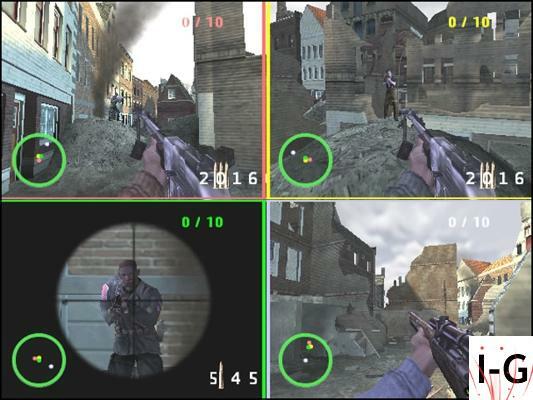 You play in four areas during WWII actually fought, namely (in order) France, North Africa, Russia and Belgium. Each of these areas comprises a number of missions in which there are eleven. The goals of the missions start at a given time to be monotonous. You have a mission when you start a headline and two sub-goals. The main objective will often "blow this or that" or "find a way out". The sub-goals are usually 'death a senior SS officer' (which are stronger than other soldiers) and 'find secret documents ". 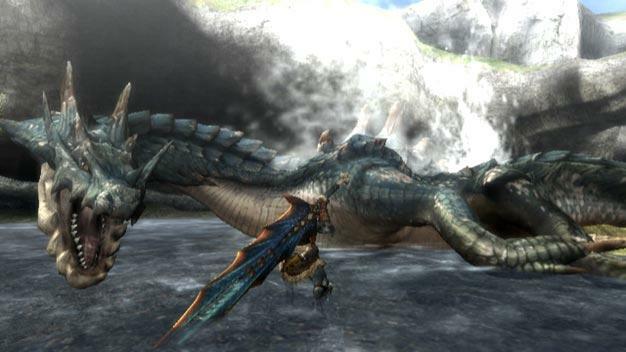 While you play you get there with sub-goals that you can play to get an extra life. The main goal you should try to achieve the sub-goals do not and while you can also decide in which order you play them. For example you can look for a number of important documents, or continue on the same objective and that one missile blowing. If you've played one level you will, depending on the number of sub-goals that you've played. Have you managed to accomplish such goals all you get the gold medal. You might think that this is a function. But no, there are no unlockables in the game so you really just a fictional medal is the sub-missions to do.